September 5, 2018, I-66 Tolls hit another high of $46.75 today at about 8.20 AM for 20 minutes and dropped to $45.00 at 8.40AM. This is just 75 cents short of the current record of $47.50 on February 28, 2018. 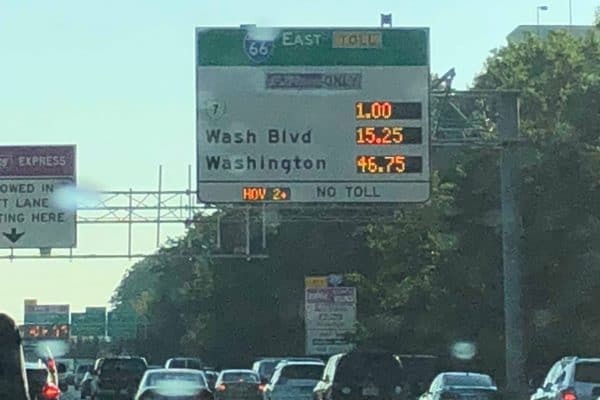 Around 40 drivers paid more than $40 toll on that day. This is probably the highest toll in the world at about $5 a mile for 9 miles. There were no known accidents or breakdowns this morning, just volume. On top of that, to the most part all metro and buses were functioning without a hitch. Traffic was light during the summer, with the schools opening this week, looks like the entire Northern Virginia workforce along the I-66 corridor decided to drive to work today. Commuters say this may be due to lack of enforcement, not necessary all of them paid the hefty toll.